Review: Home. Nottingham Playhouse Neville Studio. – East Midlands Theatre. Home is where the heart is and the heart is symbolic of love. 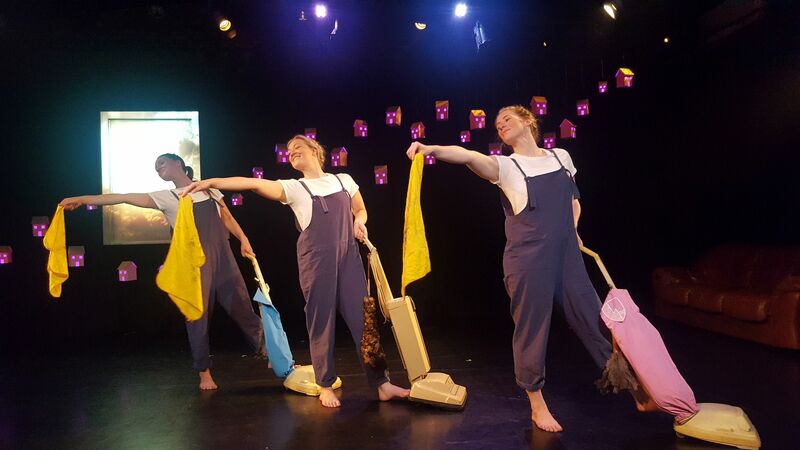 Love is clearly at the heart of this wonderful bijou dance work ‘Home’ created by Nottingham Playhouse and Next Door Dance. 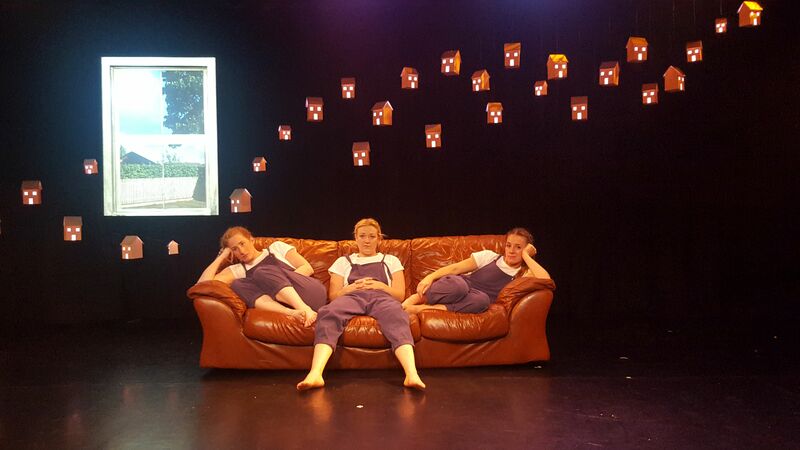 Directed by Fiona Buffini, three female dancers – Louise Gibbs, Georgina Saunders, and Laura Savage – accompanied by the sounds of a hundred separate Nottinghamshire voices, explore the notion of ‘home’ and what it means to us. The Nottingham Playhouse Neville studio is cleverly used, particularly the pretend rectangular window onto which we see various funny and sometimes moving imagery projected. Otherwise, there are string of light up model houses across the backdrop that have a feeling of houses seen on a hilly sea shore as a boat is returning home from a voyage in the dark. 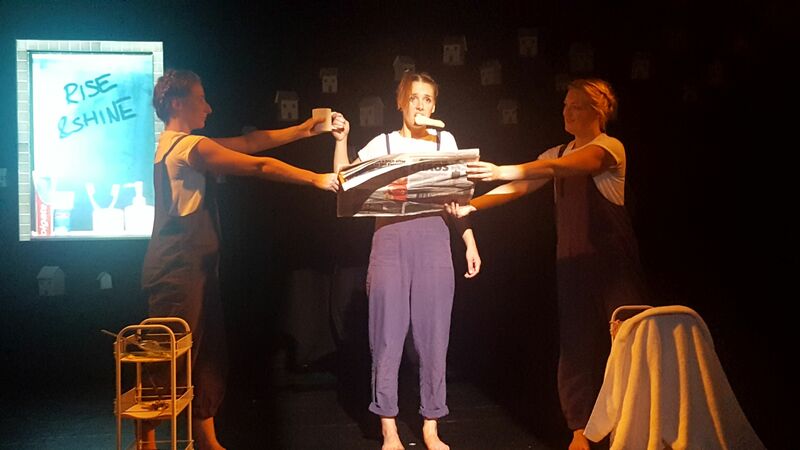 Indeed this wonderful dance piece is like a voyage in itself – from the beginning, tongue in cheek, house sale voice-over, performed as if it were flight instructions, to packing cases being brought lovingly into the new home space. The dancing is a natural extension of the voices we hear (sound bites mostly) and the forms and topics are immediately familiar such as couch sharing, cleaning, dancing in the kitchen, bedroom antics, and many more, including some touching dance vignette moments over and around a table. From the myriad sound bites we hear that the kitchen and the living room are the favourite places in the house to ‘be’ and the voices come from all ages. A few prefer the bedroom. The show ‘Home’, one time, reflects on a formerly homeless man who feels his home is like a prison until he tries to make it more homely. Equally as touching are reflections from the elderly, particularly those in an old folks home. The excellent sound and video design is by Drew Baumohl with lighting by Martin Curtis. The dance in this fifty minute show doesn’t intrude on or deflect the attention of the audience. It has the opposite integral effect as it enhances and comforts and very often wryly amuses. We get to contemplate, alongside the dancers and Nottinghamshire voices, the difference between house and home. And indeed, this contemplative contemporary dance piece stays in your head right until you arrive home subconsciously dancing with pleasure, probably in the kitchen. ‘Home’ is presently at the Nottingham Playhouse Neville studio for a short run and finishes Sat 22nd July.